You may not know the name Lynn Stelley, but if you live in Matthews you've benefited from her work. Lynn is one of the many behind-the-scenes heroes of the Matthews Police Department. Though she doesn’t drive a patrol car, in her role as Records & Communications Manager she reports directly to the Chief to ensure the administrative side of the department is running smoothly. 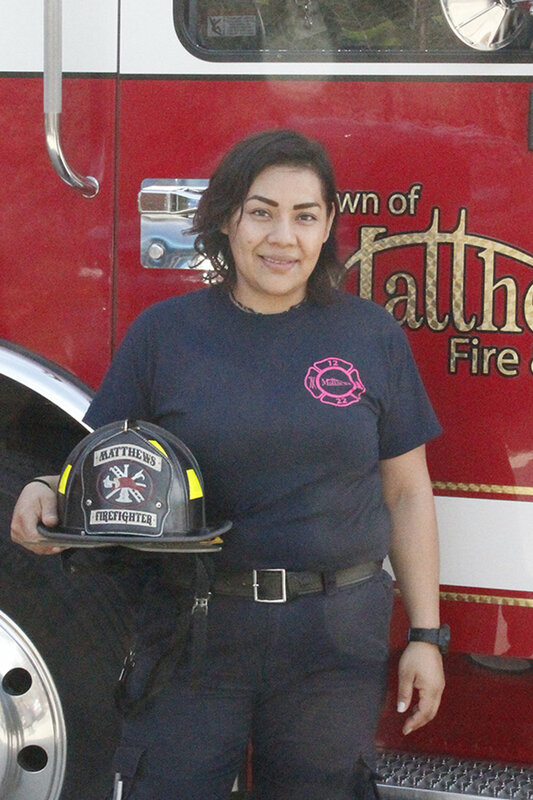 Her role is vital for both general operations and the safety of every officer serving Matthews. As Records & Communications Manager, Lynn oversees a staff of two Record Keepers, the dispatchers, and has something of a role in the department's finance. Things now are in a much more manageable system than when she started. Back then officers’ reports were handwritten, sometimes with diagrams of scenes hand drawn on the back of an incident report. The clerks would then enter the reports into the records. Now, with software and automated systems, the officers can do it themselves. Lynn is clearly happy in her office, giving instructions with the cheerful, unfaltering disposition essential for proper management. There’s a palpable warmth to her approach as she moves through the daily routine. When asked about the telecommunications position, Lynn openly admits it’s a tough role to fill. A demanding job with long hours that can be emotionally draining, which is why there’s a nationwide shortage of dispatchers. 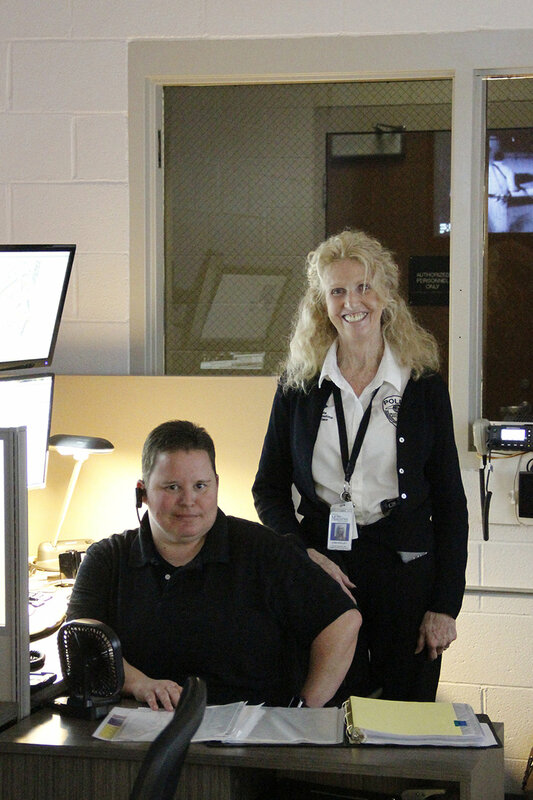 She oversees two supervisors and has capacity for 12 dispatchers (currently nine positions are filled). She’s proud of the staff for going beyond the minimum Department of Justice Telecommunications Standards and fulfilling the Sheriff’s Training Standards. Lynn has also made some changes in the dispatch room: upgraded work areas and “a little bit of paint” have dramatically improved morale. Lynn gives a quick tour of the department on the way to check in with the dispatchers. She appreciates the tight-knit cooperation of the department, "It's like a big family, and it has to be that way." The team atmosphere makes stressful situations much less so. She knows a job where emergencies happen every day can take a mental toll on her employees, expressing concern and demonstrating she has the knowledge to be genuinely supportive of them. With the pressure of a job in law enforcement, Lynn leaves work at work. It’s a necessary skill she learned from her military father. She appreciates he did the same for her as she grew up. Lynn talks as excitedly about her kids, her four grandchildren (including eighteen-month-old twins), and Bruno, her German shepherd mutt. Bruno, it turns out, is the key for Lynn’s calm. A long walk with a happy dog is exactly what she needs to unwind from a full day's work keeping Matthews safe. Land clearing began last week for Residences Galleria (formerly called Proximity Matthews), the apartment complex going up across from Family Dollar on Monroe Road. The project is a 250-unit rental community consisting of both multifamily buildings and townhomes. The developer, Taft Development / Income Investments, LLC, applied for rezoning in September of 2016. 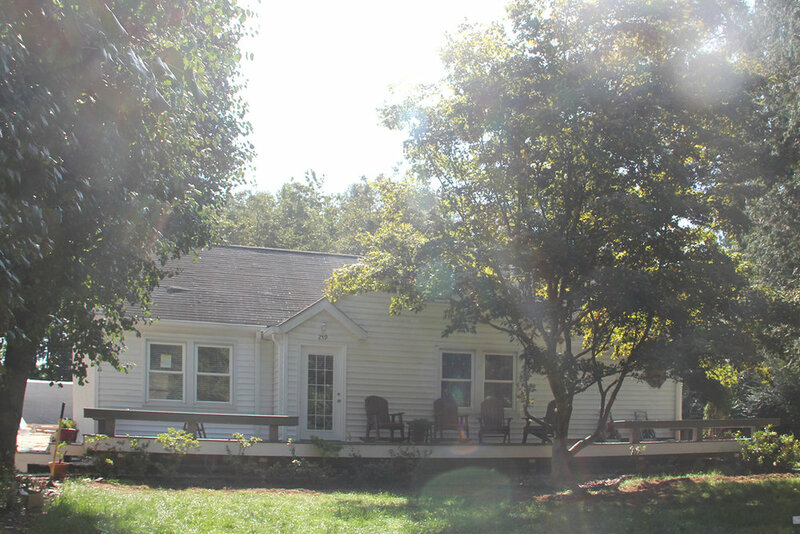 The 21.668-acre property at 10252 Monroe Road was zoned R-VS (residential, varied style with a higher density). The 2016 application requested rezoning to R-12 MF (CD) (residential, multi-family, conditional use). On February 13, 2017 five members of the Board of Commissioners (Taylor, Melton, Higdon, Miller, and Whitley) voted in favor of approving rezoning application 2016-652. Commissioner Ross opposed. Commissioner Urban, also the architect on the project, was excused from voting. 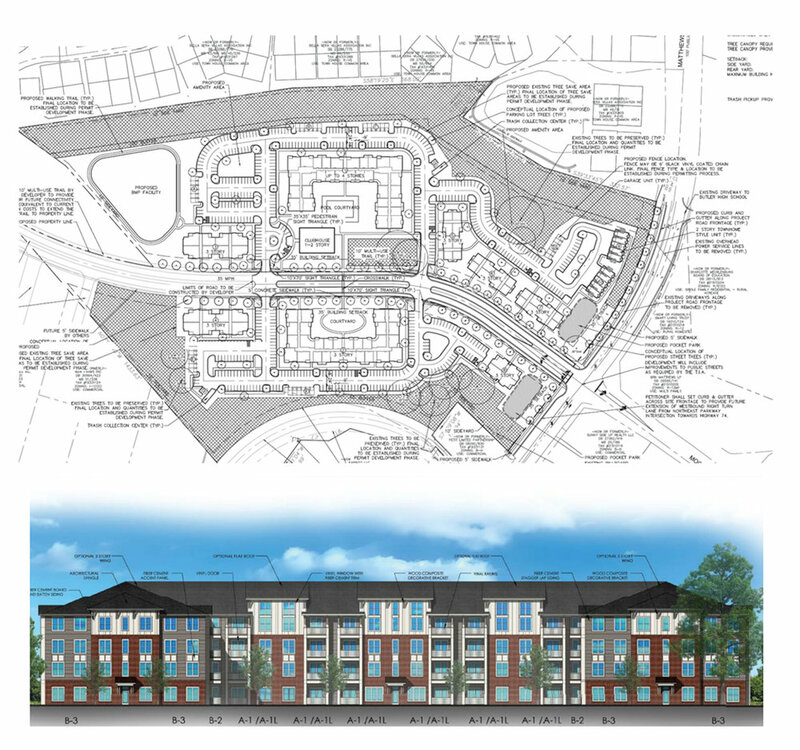 In 2015 a rezoning application for a 350-unit development on the same property was unanimously denied (Taylor, Pata, Higdon, Melton, Miller, Query, and Ross). Residences Galleria will contain garden apartments ranging in size from 750 square feet for a one-bedroom to 1350 square feet for a three-bedroom. The townhomes will be two- and three-bedroom. In addition to the building construction, Taft will place a concrete pad Charlotte Area Transit System stop on Monroe Road. They have also committed to constructing a portion of Sardis Greenway along the rear of the property, between the new development and Sardis Forest neighborhood. Plans include moving the current street-adjacent sidewalk along Monroe Road will be moved further back onto the property. While the agreement for rezoning included saving the mature trees near Monroe Rd. many of those trees were cut down. Taft will pay a fine to the Town of Matthews in the amount of $150,000 for a violation of the rezoning agreement. The project includes means for protecting the historic Rosedale Cemetery such as removing dead plant debris by hand, a perimeter fence, and an easement for public parking for access to the cemetery. Though requested, Town Staff had not received a response from Charlotte-Mecklenburg Schools in time to be included in the Staff Report presented to Town Council. According to CMS, this project will add 80 new students: 51 at Greenway Park Elementary, 12 at McClintock, and 17 at East Mecklenburg High. According to 2017 data (when the project was approved), this project will put the schools at 133%, 82%, and 112% capacity respectively. When researching rezoning and development in Matthews, the first place to go is the Planning Department section on the town website. If you’re unfamiliar with the website, it can feel buried. This is a quick tutorial to find Rezoning and Development Cases currently under consideration. On the Pending & Zoning Developent page, notice the first two columns: “Application” and “Location.” The most recently submitted application is on the top row of the table. In the application column you’ll find the number the Town has given the case as well as the project name. Under the location column you’ll find the physical address to be rezoned/developed. The next two columns show “Current Zoning” code and “Proposed Zoning” code. The codes specify the type of use (residential, commercial, etc.) and the allowable density. There are a lot of codes to remember, so we have an infographic here, created from the county’s Polaris chart. Elevations are a close approximate of how the finished building will look. The developer must notify adjacent land owners and host a meeting open to the public in order to explain the project. The Public Input document is documentation from that meeting. Town Staff examines the proposal and analyzes the information to create a Staff Report. This report compiles the site plan, elevations, comments the staff has given the developer, as well as the impact on traffic, and comments from other town departments (usually Public Works, Police, and Fire). Sometimes school impact is provided as well. The Staff Report is presented to Town Council during regularly scheduled council meetings. If you’re interested in keeping up with Board of Commissioner meetings, we’ve created a tutorial for finding those as well. In a fair amount of research for the Beacon we often cross-reference our own notes with Board of Commissioner meeting agendas and minutes. If you’re unfamiliar with the website, here’s a quick tutorial to find the agendas for Board of Commissioners (also called Town Council) meetings. The most recent agenda will be on the landing page. If you’re looking for archives of past meetings, click “Show More” at the bottom of the right hand column. Here you will find Agendas (the to-do list for the Board during the meeting), Minutes (annotated notes from the meeting), Packet (information given to the Commissioners prior to the meeting with back up material for line items on the agenda), Audio (mp3 files of the meeting), and Video (a visual and audio recording of the meeting). Video is also available on the Town’s YouTube page. This year, the Town of Matthews (in partnership with Mecklenburg County) built one new street – Sports Parkway between Tank Town and Matthews-Mint Hill Roads. The number of new streets created in previous years are: 2017 – 3; 2016 – 2; 2015 – 2; 2014 – 0. These include Lake Harmony Drive off of Mount Harmony Church Road, Downton Court in the Eden Hall development on Fullwood Lane, and Margaret Ridge Drive in the Stevens Grove subdivision off of Highway 51. The most recently created streets are Talbot Court, Hamlet Court, and Kings Manor Court. To create a street and name, developers must propose the names; the Town has code requirements to ensure that new street names are appropriate and not duplicated. Mecklenburg County ultimately approves the name and assigns the individual street addresses. The Planning Department reviews street names when new subdivisions/developments are in plan review. The Zoning Administrator, Mary Jo Gollnitz, considers the proposed street names for the Town, as do Matthews Planning Department, Public Works, Police Department, and Fire & EMS Department before the name is submitted to Mecklenburg County for final approval. According to code, proper street names must consist of one to three words, plus a street type suffix. The name must not duplicate or too closely approximate phonetically the name of any other street within the Town or county. Street names cannot include a business name, punctuation, possibly offensive words, or directional suffixes. The first word of a street name can only be used in two other locations within the county. The only exception to this is the use of a generic label naming a topographic feature or a color. According to the National League of Cities, the five top street names in the country are Second, Third, First, Fourth, and Park. According to the US Census Bureau’s US Tiger/Shapefiles, 2014, the most common street name in North Carolina is Dogwood. The top 10 street names in this state are: Dogwood (328), Park (304), Oak (261), Pine (245), Ridge (234), Cedar (225), Maple (225), Sunset (220), Church (204), and 2nd/Second (193). The naming of streets reflects the era in which it was created – 18th- and 19th-century streets often reflected English (UK) roots or defined the purpose of that road. Later 19th-century developers named streets after trees and flowers; 20th- and 21st-century streets often mirror developers’ family names. Most recently, following the rise in technology and modernization, roads are again reflecting the generic definition of the business located on that street. As explained in previous Take Me To Your Leaders posts, Matthews operates as a municipal government with council-manager leadership. Assistant Town Manager Becky Hawke supports and assists Town Manager Hazen Blodgett on a variety of town administrative tasks such as town-wide planning, special projects, and initiatives. Also serving as a back-up for the Town Manager, Ms. Hawke acts to fill Mr. Blodgett's seat in his absence. 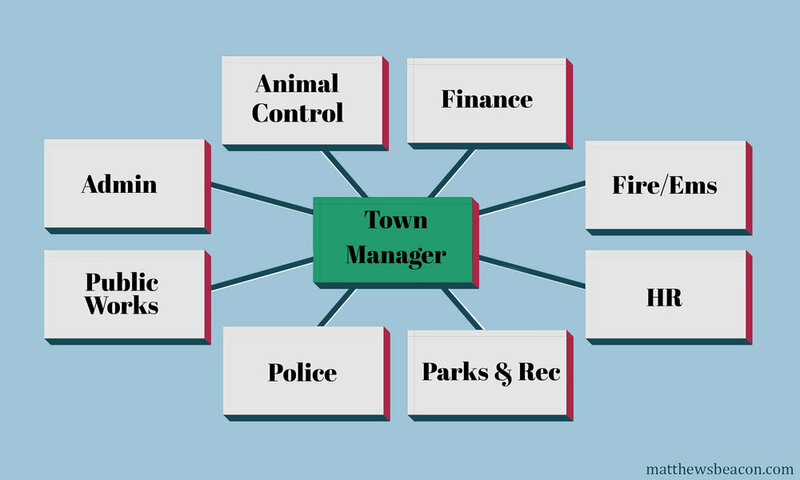 What is the Assistant Town Manager's role? The Assistant Town Manager is part of the senior management team for the Town of Matthews. Ms. Hawke provides oversight and establishes standards with department heads of Finance, Information Technology, Human Resources, Safety/Risk Management, Communications, Fire/EMS, Police, Public Works, Parks and Rec, and Planning. 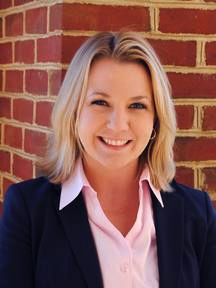 Ms. Hawke also serves as staff liaison to the Town of Matthews Economic Development Advisory Committee (EDAC). 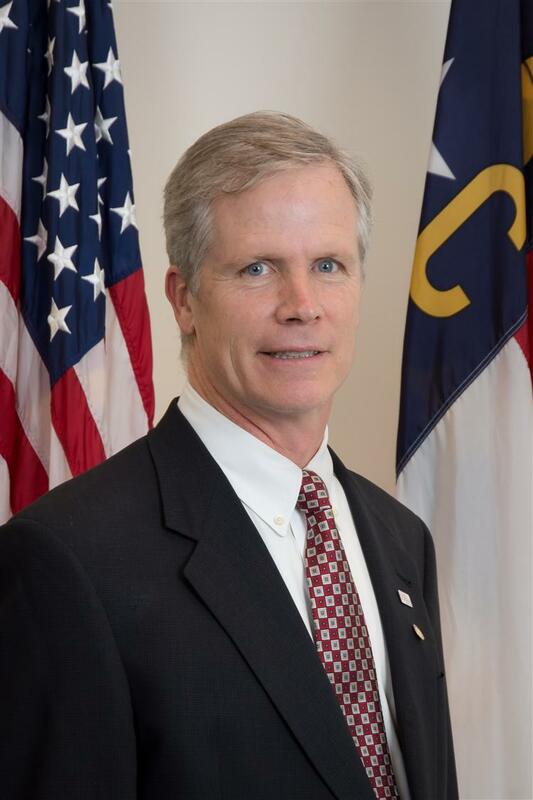 Who is the Town of Matthews Assistant Town Manager? Becky Hawke has served in local government for more than a decade and has been the assistant town manager for the Town of Matthews since 2016. Ms. Hawke pursued extensive education to prepare her for a role in municipal management. She earned an undergraduate B.A. in Communication Studies (minor in Sociology) from Hollins University, an M.S. in Corporate and Public Communication from Radford University, and a graduate certificate in Human Resources Management from Cornell University. She is also a graduate of the Public Executive Leadership Academy (PELA) of UNC-Chapel Hill. She retains active membership in several professional organizations including the International City/County Management Association (ICMA) and the North Carolina City County Managers Association (NCCCMA). In 2018 Ms. Hawke was recognized as one of the 50 Most Influential Women in the greater Mecklenburg County region by the Mecklenburg Times and one of the 25 Most Powerful Women by the Matthews-Mint Hill Weekly. Ms. Hawke further serves the community as the Vice-President (2019 President-elect) of the Matthews Chamber of Commerce. She also sits on the boards of the Matthews HELP Center and Red Brick Partnership, is a member of the Matthews Rotary Club, and is a volunteer with dog rescue groups. At home Ms. Hawke has a menagerie of pets, all of which are rescues. Among them are Titan (the blind 200-pond mastiff), Tank (a ridiculously-rotten English Bulldog), and four cats (Jenna, Ninja Cat, Geronimo, and Houdini). Last week law enforcement officers from all over the country convened in Matthews to train and certify their bloodhounds with the National Police Bloodhound Association. More than 45 law enforcement officers traveled across the country, some by plane, to Matthews to attend this five-day seminar. Instructors created scent trails for the dogs to follow, provided feedback to fine-tune the dogs’ tracking abilities, and advised handlers on best practices. If you didn’t see these incredibly hard-working dogs while they were training in town, Matthews Police Officer Kevin Osuch will have his dogs (one of which is a tracking bloodhound) at Pawsitively Matthews this Saturday, November 3, in Stumptown Park. Since 1962, the National Police Bloodhound Association has been a trusted source for information relative to the use of the purebred bloodhound in the field of law enforcement. The National Police Bloodhound Association (NPBA) teaches basic standards that have been tried and proven from many years of trails by law enforcement officers from all over the country that were found to be sound in the utilization of the man-trailing bloodhound. One of our goals at the Beacon is to highlight our many talented and interesting neighbors. We do this through The People of Matthews series, spotlights on town leaders, and the Conversations With series. Previous spotlights include Chris Sottile of The Loyalist and David Johnson of Silent Images. Future pieces include former Matthews Police Chief Rob Hunter and beekeeper Martha Krauss. Around August 10, 2018, a sign appeared on the BrookeChase property announcing a request to rezone the property from R20 to RVS on August 13, 2018. With an R20 zoning 3 homes may be built on the property. RVS zoning would allow five homes to be built facing South Trade St. and eight more homes to be constructed at the rear of that property. That plan also calls for the demolition of 60% of the nearby Green Wall, a tall, plant-lined path that lines the greenway entrance at Trade Street. In later August, Mark took out a two-page ad in a local newspaper, intending to draw more attention to this issue. Although Mark and Garry Smith had originally been engaged in dialogue to find a compromise, and Mark has talked with other town officials, the rezoning is moving forward. The project will be up for a vote during the October 8, 2018 Town Commissioner’s meeting. Mark Tofano lives in a Matthews Heritage house, built in 1942 for the Burton family. Mark’s “other life” has brought enormous success. After leaving the Air Force (after five years of service), Mark became an electronic engineer in the Cape Canaveral area assigned to the manned space program, missile defense systems and manned bombers. He also lived in Europe and spent nearly four years working on satellite communication systems. After his mother’s passing, he returned to south Florida working in sales for various companies including Olivetti and National Cash Register. He subsequently founded and funded software and electronic hardware companies, which were later (in part) sold to Apple Computer and other national/regional companies. Of late, he has been a contract consultant providing business analysis and project development expertise for TIAA, Coca-Cola, Duke Energy, and Wells Fargo. Tofano subsequently founded and funded software and electronic hardware companies, which were later (in part) sold to Apple Computer and other national/regional companies. For the past 20 years, he has volunteered with Men of Acts, an outreach program sponsored by the Central Church of God which assists the elderly, disabled, single mothers and widows by providing minor home repair services; he is a member of the Opera Carolina chorus and also provides free piano lessons to underprivileged children as well as procuring pianos for those that cannot afford them. When I began to walk up the driveway to meet the previous owner Ms. (Suzie) Burton, a peace came over me. At that moment I knew that this is where I wanted to spend the rest of my life. Ms. Burton was so afraid that I was going to purchase the home and then tear it down to build a newer home. I wrote Suzie a letter promising not to tear it down, but instead, to keep the exterior of the home as she always remembered it. I have kept that promise and will continue to do so, even though Suzie has passed away. What were your hopes for living here? 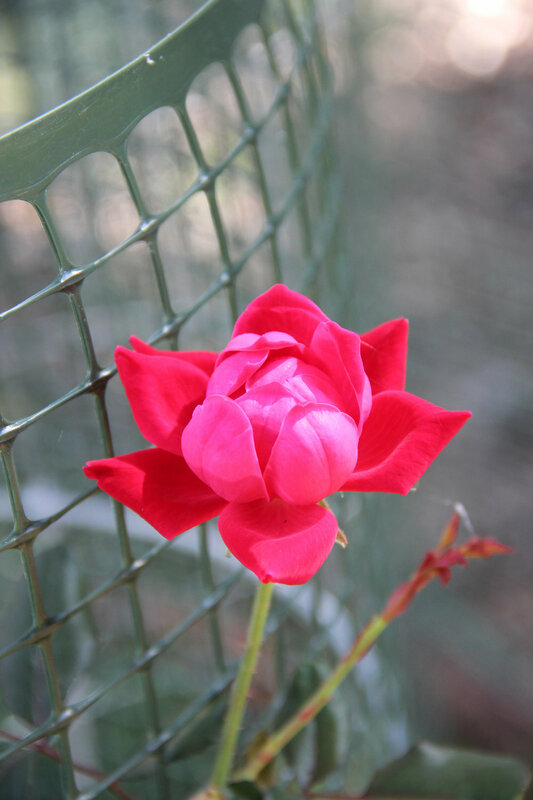 Simply to beautify the home and the property, making it an asset to the Town of Matthews. My home was one of only seven homes left on Trade Street from the Greenway entrance to Sam Newell Road. Now it is only one of six homes. 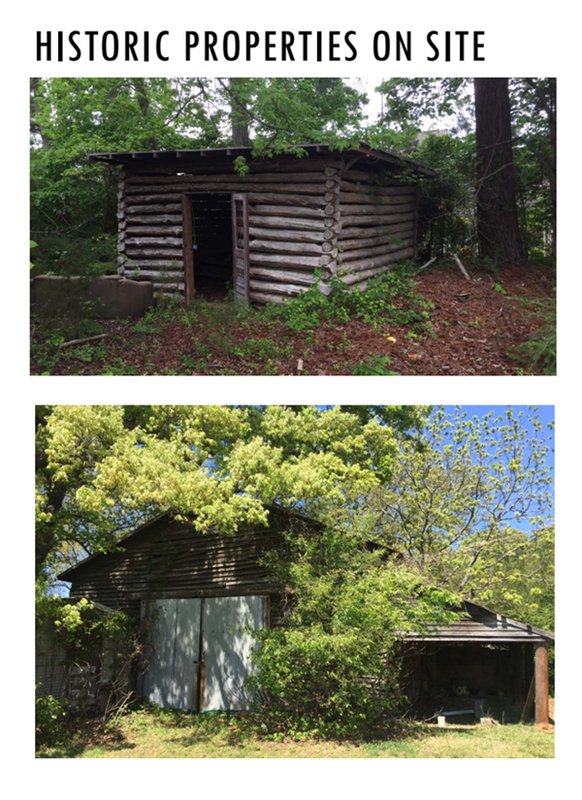 (Last year, one of the houses was demolished on the neighboring property). It appears as if people now know you through some media coverage and by your presence at town meetings regarding the land-use questions. Why does this issue touch you? The entrance to the Historic District of the Town of Matthews begins at the Greenway entrance. When pedestrians and motorists pass this point, they know that they are entering someplace special. And when they leave through this demarcation point, they feel the loss of leaving something precious behind. What intentions do you have for this movement? During the process of opposing the rezoning of 269 South Trade Street, it became apparent that there are many practices of the town government that could be improved and others that could be added or removed. The most glaring deficiency (in my opinion…) is that there is a lack of real transparency in our town governance. In the age of electronic communication, there should be live broadcasts of every council meeting, live feeds of meetings via YouTube, Facebook or the like as well as a robust means of communicating to the public what is happening in government, and where and when it is happening other than through the town website or emails. Have you ever been involved in town-related issues, before? This is my first foray into the matters of local government. Like so many people that I have spoken with that are involved in local government, they made their entry because of issues that occurred within Matthews that they found to be unsatisfactory or unsettling. In fact, in speaking individually with each of the commissioners, I have found that some of them entered politics for this very reason. I have never considered myself an activist as the word may be interpreted today. Perhaps, years ago, in my youth, I would have managed myself more in this manner, but as the years have passed and maturity, wisdom, and experience have taken hold, I have found that a more effective means is through dialogue, understanding and appreciating an opposing opinion and then attempting to find a middle ground, a compromise. Do you feel that this issue is now your cause or passion, or does it fit into a greater philosophical life plan? At the moment, waging an opposition to the current site plan for the rezoning of 269 South Trade Street is my cause and it is my consuming passion, as it is the passion of many other fine people that have joined with me in opposing the plan. Even when this issue is resolved, this passion will be redirected to the many other issues that, in my opinion, plague the Matthews Township government and how it serves the citizens of the town. I hear you are building a backyard bocce board and constructing a two-car garage nearby with a roof which will be used as a viewing stand for this sport. This is quite a remarkable undertaking! Why have you decided to build this? I am one of the last 100% Italians in the Tofano family line. I lived in Europe for a number of years and have made frequent trips to (see my relatives in) Italy. The visual image of families in a community playing Bocce Ball in the village has burned into my memory. When I purchased my property, I saw the possibilities of actually having a Bocce Ball court on my own land which I have named “Cielo in Terra” - heaven on earth. This landscaped open court will be much more than a playing field. It will (also) be a place for friends and family to meet, to play, to enjoy life and to enjoy each other. 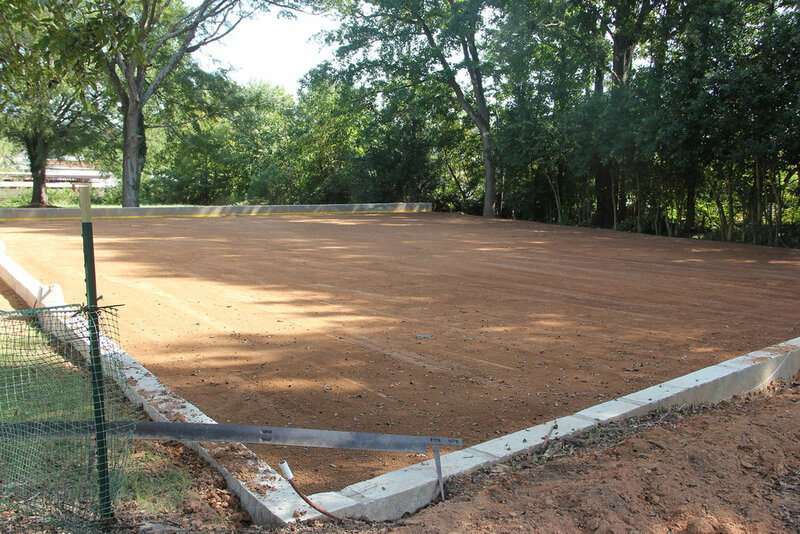 Tofano has a leveled and compacted area in his backyard prepared for a full-sized bocce ball court. What do you want people to know about you? I came from humble beginnings; my parents were children of Italian immigrants and did not graduate from high school. At the age of five, my parents thought that I might have talent with piano and found an accomplished pianist acquaintance who agreed to teach me for free. This act of kindness gave me a lifetime of enjoyment playing classical piano. (As noted, he now teaches piano to others.) For those families that have insisted on compensating me in some small way, I would agree to have dinner with them before the lessons. Has your approach regarding the town and its greenways changed since your first foray into this arena? My focus since the inception of the campaign to oppose the rezoning plan is the preservation of the greenway entrance “Green Wall” and to save the look and feel of entering into the Historic District on South Trade Street. That has not changed. From the beginning, there were only two conditions which I have stated that are fundamental to my request for reasonable development: 1) that there would be no more than three houses facing South Trade Street and that these houses will have the average footprint, style, height and setback of the six remaining houses on South Trade Street and, 2) that the dense natural growth buffer between the site and the greenway entrance and the elementary school grounds be preserved. What are your intentions for the future? Life will continue much as it has…working to beautify my property, volunteering in the community and maintaining a close relationship with all of the wonderful people that I have met in the course of the opposition campaign. As for being an activist, my desire is that all citizens in the town of Matthews become “activists,” that is, to actively participate in their local and regional governments. And finally, what are your hopes for the future of Matthews? My desires for the lovely town in which I have chosen to call home is that it maintains its charm throughout the inevitable growth that it will experience. In addition, I hope, I pray that the citizens of Matthews will be given a voice, a strong voice, in how their town develops. I intend to be instrumental in helping them have that voice. Proceeds from a Budget Ordinance Amendment will be dedicated to the police force for bulletproof vests. The Board of Commissioners will receive an update on the 2018 Planning Conference To-Do List. The Planning Conference is a three-day public meeting where the board discusses a broad array of items relevant to Matthews (see Meeting Packet pages 22-24). This conference will be in Matthews and the public is welcome to attend and listen. The Board of Commissioners will consider methods for streamlining their meetings, especially during lengthier ones that include Planning and Rezoning. Notes for these considerations are in the Meeting Packet (pages 26-30) and vary from suggestions limiting the time for staff and applicant presentations to requesting speakers from the public limit their time to five minutes. The Board will review the emergency services’ responses to Hurricane Florence for successes and opportunities for improvement. News About Town: Saturday, September 22, 2018, from 9:00 AM 12:00 PM, the Town of Matthews will hold a Community Meeting at Matthews Town Hall (232 Matthews Station Street Matthews, NC 20815). If you’re curious what an overlay means, or if it affects you as a property owner, this will be a good time to get all the answers. News Above Town: The weather seems stuck: high of 89, low around 68. We’ll get a few days of slightly cooler temperatures starting Friday, so at least there’s that. News Around Town: Family Dollar is packing their bags. In a statement released Tuesday, Family Dollar, a subsidiary of Dollar Tree, announced the consolidation of their headquarters in Chesapeake, VA. The closure will affect approximately 900 jobs. One Good Thing: Barks and Blooms, a Matthews-based pet sitting service, has organized a supply drive for pets affected by #Florence. Drop off items needed (see list above) at Your Mom’s Donuts or other area locations. Collected items will be taken to high-need areas such as Lumberton and Robeson County.